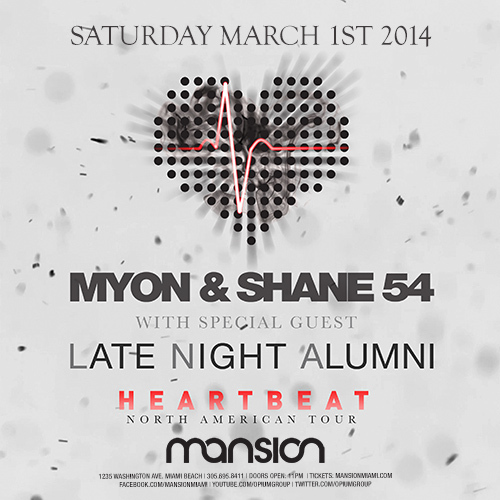 Attend The Crowd Party w/ Myon & Shane @ Mansion Nightclub , 10:00 PM - 05:00 AM on Sat, Mar 01 2014 @ The Cabaret , Miami Beach, FL, USA 1 TICKET. 3 PARTIES. ONE AMAZING NIGHT ON SOUTH BEACH! This event... Pre-Party @ The Cabaret Dance Party @ Mansion nightclub After-Party @ dream hotel highbar JOIN THE CROWD. PARTY LIKE A ROCKSTAR! Here is the lineup... The Pre-Party, from 10 PM - 12 AM. Meet, mix and mingle with the Crowd. FREE, all you can drinks are on the house! WE BREAK THE ICE with a mix of innovative social games, personal one-on-one introductions, amazing hosts and hostesses, you will never have more fun meeting and making new friends. Plug into the Crowd, and get REALLY ready to party like a ROCKSTAR! The Dance Party, from 12 AM - 3 AM. THE MAIN EVENT. The Crowd heads to one of the Beach's premier dance nightclubs for the time of your life. Huge sounds, huge dance floors, huge crowd. NO mood-killing waiting lines, we deliver VIP entry to the hottest dance clubs on the Beach. Within the Crowd, you are a celebrity, and will party HARD with YOUR CROWD! The After-Party, from 3 AM - 5 AM. The perfect ending to your night out on the Beach. Hosted in a cozy, intimate lounge, you can sit down, catch your breath and cement new friendships made in the Crowd. With FREE drinks on us, it's a quiet place to share a night cap, exchange digits, and of course, create your happy ending.... PRE-PARTY @ DANCE PARTY @ AFTER PARTY @ GET YOUR PARTY PASS NOW! HIGHBAR, Dream's rooftop South Beach bar, is a high design oasis outfitted with low-slung seating and atmospheric lighting. Views include the expansive Atlantic and the electric cityscape below. Lush landscaping and private seating areas surround the roof, including two coveted cabanas with flat screen TVs, and an air-conditioned bar serves drinks and cocktails from morning to night. Our cocktails are diverse and tempting, including such creations as Peggy's Punch, with Belvedere Vodka, watermelon juice and fresh basil, or HIGHBAR frost to cool off with a frozen pina colada.